As a now well-seasoned life coach (extra spicy! ), I have accrued many life coach business lessons. And I’m here to share them, so that you can avoid my pain. So feel free to use what works for you, toss what doesn’t, and most importantly forge ahead as a coach. Frankly, the world could use more people like you, focused on helping others. Life Coach Business Lesson #1: You will be okay. 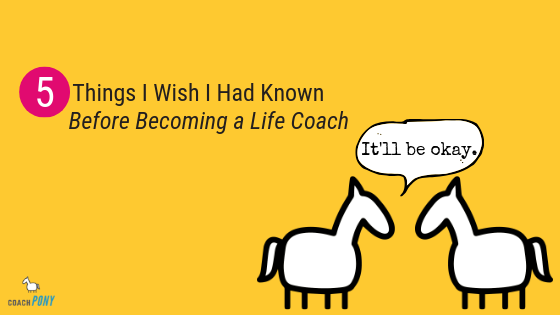 If you are anxiously chewing your nails or fidgeting in your seat every time you think about becoming a life coach as your job, and you can’t seem to make forward progress because of FEARS and DOUBTS and maybe ENDING UP ON THE STREET, then I’m here to tell you that you will be okay. I don’t know if your business will work out for you, that’s true. But I do know you are a caring person with ambition, and therefore even if the worst happens and you can’t pursue coaching as a profession, you’ll figure out a way to support yourself and you’ll be okay. But when I sat down and did my crash and burn exercise (here’s how to do it if you want to do one), I quickly figured out that I would be okay. I had options, I most likely wasn’t going to end up homeless. Most importantly, I realized would regret not trying to do this thing that I loved, and fear was not a good enough reason not to try. I only wish I had tried to do it a little sooner. And you guys, I love coaching. And I know you do too. I love it so much I publicly wrote about how over consulting I was. In many places. Shortly after quitting my job. Which is when I realized I had burned MANY bridges and MANY options, and I still was okay. Life Coach Business Lesson #2: Do less, but better (especially in marketing!). Ooh. I made every textbook mistake as a new coach. I rushed out with no specific niche (need help with yours? Here’s a fancy-pants workbook to help you find your niche in the simplest way possible). I offered to be everything to everyone. Executive coaching? Sure! Resume help? Sure! Interview prep? Yes! Passion help? Of course! General job search? Obviously! So, I was exhausted, confused, and making no traction. And I was slowly becoming convinced that everyone hated me because I was not making progress. Marketing = hard on the ego, and you start to get a little crazy pants if you don’t have results. So here’s the thing: It wasn’t until I focused, both my niche AND my marketing, that things got better and I started to get people to pay me thousands of dollars to coach them. I did less: I coached on a narrower topic (passion for professional women) and I marketed in fewer places (I focused on speaking because, and this is the critical bit, I liked it), and suddenly things started to work! I was able to identify where to spend my time in marketing because I was so focused on the kind of marketing I enjoyed, AND who I was serving. So frankly, it was easier to ID speaking events and to get better results as a coach, since I was no longer trying to be great at everything. Life Coach Business Lesson #3: Marketing is tiring and uncomfortable, but eventually it becomes fun…with time. Part of the reason I personally hated marketing in the beginning is because it is uncomfortable. It’s uncomfortable for two reasons: 1) Because you are putting yourself out in the world and that’s HARD and 2) You usually have to learn some new skills and a new way of being, which takes time and is also HARD. 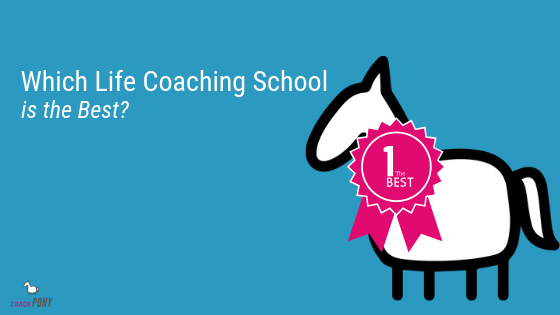 Most coaches – and I did this for a bit – try to be on Facebook, and Twitter, and Pinterest and do some speaking, and run a workshop etc etc, running around like chickens chasing whatever sparkly object, and then they wonder why they fail. When I finally sat down and started to think about what I enjoyed/was a little good at, and then focused on that, I became so much better as a marketer. I was also a lot smarter with my energy – I was only focused on public speaking, so I was able to get a LOT better at public speaking, selling from a talk, and getting asked to speak (and paid to speak!). I studied pitching, networking, speaking and selling, and those things helped me market myself as a speaker, and make offers to people in the room. It took time, and I got rejected a lot, but as I learned the skills and put my efforts into one place, I started to see results, it got better, and I got a lot more comfortable. All of these things conspired to *eventually* make it fun. Sure, it was tiring, especially in the beginning because – hi! Rejection! And it was tiring because I was putting myself out there, and that requires mental and physical energy. But, I built traction SO MUCH FASTER than I ever would have if I had kept chasing 9 different things that I didn’t even like (Hi Facebook! ), instead of doing one thing that made me feel reasonably good. (There was a period where I hated Facebook, HATED IT. I like it now, but that took…years. And you DO NOT need Facebook to build a business that will support you. Seriously). Life Coach Business Lesson #4: It’s almost never the right time, so at some point you have to just do it. Starting a business is like having children (or so I’ve been told – full disclosure: I don’t have kids. I do have adorable nieces and I enjoy giving them sugar). There’s never a perfect time to have kids, just like there’s never a perfect time to go all-in on your life coaching business. There’s always going to be a reason why you should wait – and that reason is almost always going to be compelling. Now, should you quit your job tomorrow? NO! Of course not. Then you are basically in the zone to start to think about going all in. 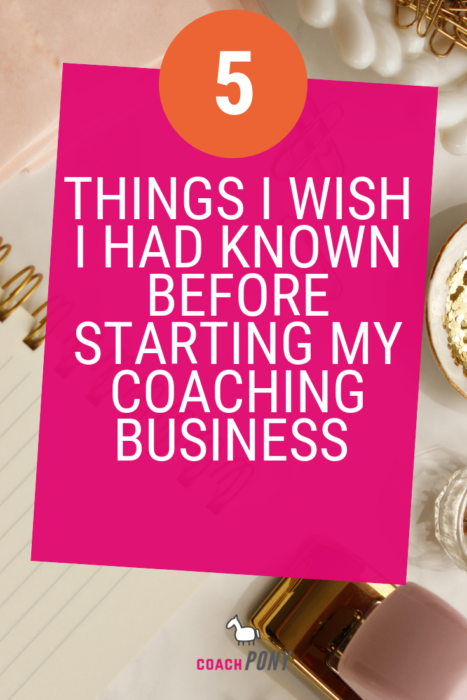 I had about a million reasons as to why I should stay as a consultant and not try out this coaching thing, and even after I had my CPC, a website, some training, and a niche I *still* went off the rails a bit and delayed really doing it. I was so afraid. Fetal position afraid. So if that’s you, I get it. But for me, it came down to asking myself “Is this the life I want to lead – or do I want to actually try to do something I love?”… in several different variations. I talk more about that process here, and how I got past some of my fears, if you want more insight. Don’t allow your fears to make all of your choices. Allow some space for your dreams to do that. Life Coach Business Lesson #5: The sacrifices aren’t nearly as hard as you think. So, I was a fancy-pants consultant in DC and I had a nice lifestyle. Full disclosure: I’m about to say something douchy, so feel free to judge me :). But it’s important to my point. As a single-woman, this apartment was a dream. Whoever designed my building in the ’60’s really *got* me. And, in addition to a nice place to live, I was also able to go on vacations and spend money on little luxuries like shoes and makeup. I was paid well, and I had disposable income. It was nice. Anytime I thought about being a coach, I thought about all I would lose. The apartment, the vacations, the dinners out, the regular paycheck. Which – of course – kept me stuck. Here’s the thing I wish I would have known then – the sacrifices, in the end – weren’t such a big deal. And stuff I wouldn’t have contemplated when I was working as a consultant were an easy yes as a coach. The reason I was so focused on my lifestyle was because I wasn’t fulfilled by my job. Planning vacations was a nice distraction. Buying shoes gave me a feeling of joy I didn’t get at the office. And so on and so forth. Things changed when I was doing something I was excited about. When I quit consulting, I gave up my apartment and moved into a friend’s basement for three months. It was deep in the Virginia suburbs and allowed me to wrap up some stuff in DC, plan my move across country, and save money. Then when I moved to San Francisco, I lived in a TINY studio for 10 months. Following that, I moved in with my now-husband, and we lived in an only slightly-larger studio condo for a bit. Yep, the girl who couldn’t contemplate sharing 4 closets was suddenly living in a studio, and sharing a closet with someone else. And is the thing that would have shocked consulting me: I was totally happy to do it! We wanted to save money to buy a larger house in the Bay Area (not an easy feat), and I wanted to able to plow more money into my business, so I could grow it a lot faster, without a ton of stress. The sacrifice of space didn’t seem like such a big deal. Even when I was making far more money as a coach than I ever had as a consultant, it was fine. I was focused on the work I was doing. And I wanted the freedom to be able to do it the way I wanted. And then we bought the house :). So if you are worried about the sacrifices you will have to make (and you will probably have to make some, I’m not going to lie), I’m here to say that you’ll be surprised how little some of them matter. I know my life and my options are different than yours, and you may have other considerations to worry about. But, even so, my point remains the same: Some of the stuff that you deem hugely important now, in your current life, won’t be important at all when you *finally* get to do the work you love. But is it worth it? Yes. I just want to say that I’ve been doing this for a long time, and I’ve had some dark days as an entrepreneur. But even my darkest day is better than my best day as a consultant, because I love what I do. So, I’ve never once looked back. I just want you to know that – this is work worth doing. 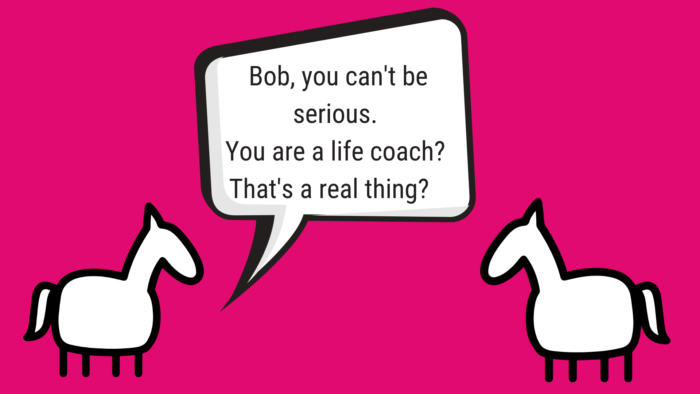 Then immediately, without stopping to pass go, read this awesome article on what successful life coaches are really selling (it’s not what you think) – plus the 5 super critical key systems you need to have in place for your business. Find it here. Let’s make you successful!